A dog. In a bag. 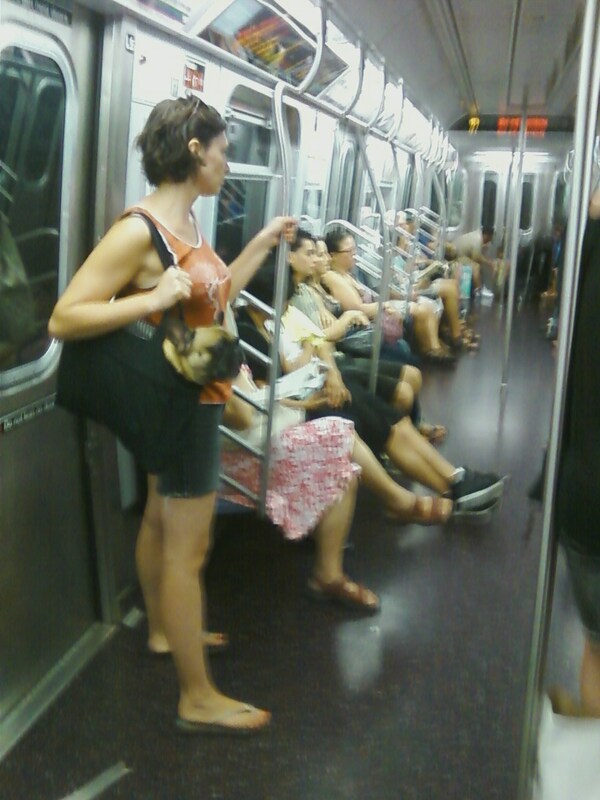 On the subway. Q. But Andrew, I want too much information! Q. You have to be kidding, that's your blog? A. And you can get to my other blogs from it: blog.pandoramachine.com , blog.tyrannosaurusmouse.com , etc. Q. Wow. You really overshare! A. Do you want to see some pictures of cats? Q. It's the Internet. Of course I want to see pictures of cats. A. http://blog.pleasurefortheempire.com/2010/12/no-paws-on-table.html look around but there are plenty o'cats everywhere. Q. Are you sure the terms of your release into society allow you contact with people who aren't completely off their rockers? A. That's why I talk to you. Q. Suddenly, this isn't going well. A. You should be surprised we made it this far, considering the drinks your little sister was funneling me. A. I'm hoping those were roofies. Otherwise there's an un-tranquilized horse running around here. Q. Can I help you? Q. I was thinking tranq dart from a helicopter as you run across the Serengeti plains.